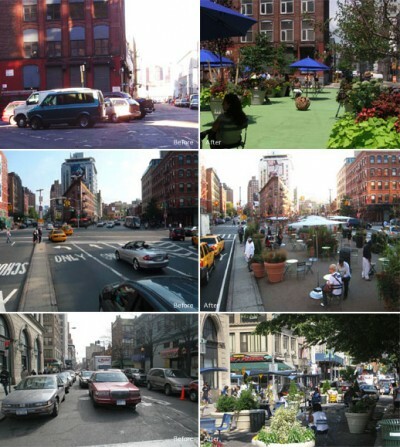 In another example of a picture being worth a thousand words, here are three before and after shots of pioneering New York City’s DOT (Department of Transportation) plan to transform auto-oriented corridors into pedestrian places and destinations. Pearl Street Plaza, Brooklyn (Top) – An asphalt parking lot is now in the middle of a final transition to becoming a restored cobblestone plaza, hosting farmers markets and concerts. Read more about this street-turned-plaza, with wide-angle shot, in this NY Daily News article, Plazas are beauty of a plan. DOT Commissioner Janette Sadik-Khan said at the time in August 2007, “And it’s just the beginning.” She’s right, see the last line of this story. Ninth Avenue at 14th Street (Middle) – See how this Meatpacking District community-lead process began in this 2006 CoolTown entry, A NYC ‘beta community’ to build a piazza. Willoughby Street Pedestrian Plaza Brooklyn, 2006 (Bottom) – Check out a link to a video of this street’s transformation along with a larger image and description in this previous CoolTown entry, Hey, let’s try it. This is indeed just the beginning, as the NYC DOT looks to fund at the very least eight more of these in their new NYC Plaza Program.